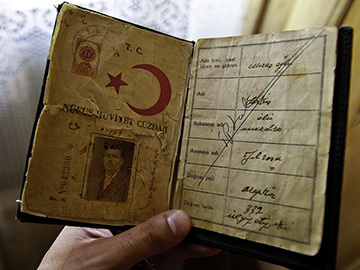 The search for identity in Dersim. Part 2: the Alevized Armenians in Dersim. Hranouch Kharatyan, ethnologist, addresses the issue of alevized Armenian in Dersim who had to hide their origins all throughout the 20th century. According to her, the slow and continuous process of Alevization of the Armenians began in the 19th century and accelerated in the 20th century after the 1915 genocide and massacres of Dersim in 1938, making virtually impossible to differentiate between Armenians and Alevis. Being an “Armenian” in the present-day Dersim is a recollection about the Armenian origin only. According to the various authors’ evidences the Armenians in Dersim made about the one-third of the population in the early 20th century. Inside Dersim they were called “Armani” and the Armenians called themselves “Hye”. The identity of the Armenians was characterized as follows: Christianity, Armenian language, Armenian names, some folk rites, and some differences in clothing and dishes. The Armenians were traditionally more literate, many villages had still churches with parochial schools and they communicated with the Armenian Patriarchate of Constantinople and Dioceses of Yerznka and Kharbert. In other words, anyway the Armenians had national institutions and though they were scattered all over Dersim, their national life (education, holidays, pilgrimages and the internal social hierarchical scale) was overall organized. However, essentially they were the lowest social stratum in Dersim and basically did not take part in the internal fights for resources in Dersim. Generally it was easy to own the property of the Armenians, because the robbery in Dersim was considered a way of living and was not condemned, and the Armenians were not involved in the robbery. Most Armenians were trying not to take part in the resistance against the Ottoman Empire, which, in its turn, was constantly trying to submit Dersim. Only those Armenians, who actively participated in the self-defense actions of Dersim and were small in number, were invited to take part in the discussions held by ashiret chieftans. The Mirakyan family was much more famous, which in Dersim was internally perceived as an ashiret. Within the 19th century some Armenians emigrated from Dersim for various reasons, some of them were turned into the Alevis and their number gradually diminished. There were also Sunnized-Kurdized Armenians there. Religious conversion did not take place individually; generally the whole settlement, mostly villages were converted. The Alevized and Sunnized Armenians were quickly involved in the internal relevant social strata in Dersim within the scope of this or that ashiret. However prior to the 19th century religious conversions were wide-scale, and according to the records, ancient Armenians occasionally set up separate ashirets, and following the internal rules of Dersim, took their place among other ashirets by using weapons. Wide-scale religious conversion of the Armenians started at least since the 17th century and already in the 19th century the conversion reached a point, when it was not only very difficult to differentiate between the Armenians and Alevis outwardly, but also the social-cultural life of the Alevis was much like the Armenian one. The bulk of the population, that was called the Alevi, remembered its origin very well, moreover, they were in touch with their relatives, who were still Armenians then. Sometimes half of the dynasty was considered Alevi, and another half Armenian. “My grandpa would tell that his grandpa’s father’s brother occasionally was the abbot of St. Karapet monastery in Havlori”, “… our forefathers were also Armenian, even the sons of my father’s brother … though they speak Alevian language, they maintain their national origin”, The Kurdish population of Ter-Ovan “village never renounced their (Armenian) origin and the Pir (spiritual leader) of the Aghujans’ house, the grandson of Tevresh-Kulap Seid-Ali, would proudly tell about the Pir of their house, called Ter-Ovan, who was living in Tiramor Monastery as an abbot then”, “Garapashan ashiret chieftan, named Suleyman agha (title) of Torne Garapash, was one of the descendants of former priest” and so on. The population in Dersim knew the Alevized Armenian villages very well, such as Ipigale (Melikaberd)  in Khozati region, Ulukale (Mets Berd), Memgan in Balu region, Tujik on the slope of Tujik-papa mountain, Mamegi (Mamik) on the southern slope of Mal mountain, called Tsin, Tahar (owned by ashiret of the Mamguns), Pir-sultan (owned by Mamgun and Sheykh-Hasanan ashirets), Izoly, Mokhnty in Charsanchag region, Tiravan in Ovachik region, Sekyutly and many other villages. Observations and records of the Armenians writing about Dersim evidence that the history of Alevization was rooted in the memories of at least some of Dersim Alevis. For instance, Andranik writes, that “if not all, but at least the majority of the Tersims thinks that their forefathers were Armenian” (examples are mentioned). The slow and long process of Alevization of the Armenians resulted in the formation of the same common living environment for the Armenians and Alevis in Dersim. The Alevized Armenians continued to implement numerous pre-Christian and even Christian rituals, numerous Christian and pure Armenian elements had been synthesized into the Dersim “Alevism”. Both genealogical and social-religious past of the Armenians and the Alevis, who appeared in Dersim, are the same in the Alevian oral legends. The local “Armenian Keshish” and the new-comer “baba”, S. Gevorg (“Hazret Ilias”, “Khydyr Elia”), S. Sargis (“Khydyr of Hazreti”), “Anna Fatima” having inherited the functions of the Goddess Anahit, and Anahit’s former shrines, even Mesrop Mashtots (“Masrup”) and others are mostly the heroes of the stories (“masalas”) of the Dersim Alevis, who this or that way have their roles in the historical past of the people in Dersim. According to the folk etymology the word Dersim was derived from the name of the Alevized Armenian priest Ter Simon (Tersimon, Dersimon) in the early 17th century. St. Karapet monastery in Armenian Havlori, “which is the only living monastery in Dersim”, was very important for “the Dersim Armenians and Kyzylbashs… Karapet monastery in Havlori is for all, and all is for the monastery. All, both Armenians and Kurds, equally worship the monastery and once or twice a year would go on a pilgrimage to Dersim from everywhere with lots of gifts and sacrifices”. Taking into account the devotion of the Kyzylbashs to the Christian monuments and existing churches, Andranik writes: “The belief of the Dersims is more powerful than the belief of the Armenians”, “The Kurds’ belief is more than the one of the Armenians”. Without referring to the hypothesis that the origin of the Dersim Alevis is Armenian in general, it should be only confirmed that both the Alevis and Christian Armenians thought that the bulk of the Alevian-Kyzylbashs in Dersim had the Armenian origin. Even if such number of the Alevized Armenians was the result of the subjective perception, it should have been a signal for the authorities, which had anti-Armenian plans, to bother on possible Armenian-Alevian political unity. A number of the Alevian-Kzlbashs tribes, which were considered the “Kurds” of Dersim, took an anti-Sunni position and did not take part in the massacres of the Armenians, which were organized by the Sunni-Kurdish Hamidiye cavalry units in the 1890s. The apparent pro-Armenian position of the Alevi Kyzylbashs evidently caused anxiety to the authorities conducting anti-Armenian policy. The Turks knew the following wide-spread saying quite well: “Less than the thickness of an onion skin separates the Alveis and the Armenians”. Underlining the personal identity of the “Kyzylbashs”, different from the one of the Sunnis, also caused anxiety to the Young Turks, who were in search for advantageous interpretations within the “Armenian context” to struggle against the very identity. The Young Turks Riza Nur probably presented the general approach of the Young Turks to the problem, saying that the personal identity of the “Turk Kyzylbashs”, different from the one of the Sunnis, is the “outcome of the fake Armenian propaganda”  during the rule of Abdul Hamid. It is obvious that the political approach of the authorities towards the Alevi-Kyzylbashs in Dersim was derived and, minimum in the last one hundred and fifty years, has been derived not only from the Alevian self-isolation opposing to Sunnism, but also from the Armenian-Alevian privy past. All this is well known to the Dersim Alevis. In any case, preparation and implementation of the genocide of the Armenians in 1915 caused lots of anxiety among the Alevis in Dersim. They were sure that next they would be either forced to renounce their Alevi identity or slaughtered. This was a serious reason for the “Armenian volume” of the Dersim Alevi collectivity to substantially “diminish”, and not to be spoken about at least in 1915 and thereafter. Both the Alevis and the Armenians, who had been Alevized prior to the 20th century, were interested in forgetting the “Armenian volume” of the Dersim Alevis very quickly, even if the “Armenian volume” wasn’t big. However, no matter how much both the Armenians and Alevi-Kyzylbashs were interested in forgetting the presence of the Armenians in the collectivity of the Alevi-Kyzylbashs in the early 20th, the actions of the 20th century (that is the Genocide of 1915 and the massacres of the Alevis and Armenians in Dersim), persecutions followed thereafter resulted in the emergence of Armenians within the Dersim Alevis, arousing new issues of the search for identity. “We are from Vardenik village, that is to say my father was from Vardenik, but I was also born in Vardenik. In 1994 the soldiers destroyed Vardenik and prohibited to live there thereafter. Now I live in Tunjeli. Vardenik used to be a big village. All were Armenians, Alevi Armenians. We are the Haydarans, but I don’t know when and how we became the Haydarans, because, before that, when our parents were still Armenian, they were the Mirakyans. Maybe after 1938, or maybe after 1915. In 1915 our village was not invaded. But they were also massacred in 1938. Everybody here knows that the Haydarans and the Demalars are former Armenians. The massacres of 1938 were not similar to the one of 1915. Before the massacres of 1938 the spies made reports and compiled lists of suspicious people and villages. The massacres took place according to these lists… In 1938 when the people in Dersim were slaughtered, the Dersim Armenians were smashed in particular. Vardenik was completely deserted then, everybody was taken to Kojakoch and killed, even two-year-old children. They were annihilated in a way that it was impossible to find even their corpse. Both my grandma and grandpa were also killed here. Only my father survived in a village in the mountains, he was eight years old then. A few children, like my father, with their total number reaching 30, grew up a little and returned to Vardenik In 1945-47. The massacres had been already finished then. After he returned to the village, he became an Alevi. Those Armenians, who survived in the massacres of 1938, became an Alevi. My father became an Alevi after he had returned to Vardenik, it was after the 1940s. However, in the 1980s the government made them leave the village… Those who didn’t leave the village by then were forced out in 1993. Since then it has been prohibited to go to Vardenik… I even don’t know whether my parents knew Armenian or not. Maybe they knew, but didn’t speak. They never spoke in our presence. It was dangerous to speak Armenian in general. My generation doesn’t know Armenian. My parents, especially my forefathers were Armenian Christians, Armenian. Our fathers became Alevi after 1938.My father named me Ibrahim, because it comes from the name Abraham, Armenians pronounce it as Abraham. My father gave me this name intentionally purposely, because this was the name that the Armenians have. Here, in Turkey it was not allowed to give other names to children. This was prohibited in the 1930s; everybody should have had Mohamedan and Turkish names. Now there are no Armenians here, all of us are Alevi. But everybody knows who has an Armenian origin. Everybody knows that the people from Vardenik have the Armenian origin. Nowadays, it doesn’t matter whether you are Armenian or Alevi, the government does not like both of them." What is the “Armenian volume” in the present-day population of Dersim? Hardly anyone can answer this question. On the one hand the Armenians were interested in concealing their past during the 20th century, on the other hand, after being turned into Alevi, Armenian-Alevian marriages became first of all very frequent, and secondly ubiquitous. If up until 1993-1994 the forced displacement in the mountainous settlements maintained certain Armenian endogamy in the settlements of the Alevized settlements, then during the last 20 years it was practically impossible even if there was a wish. The efforts directed towards burying the mixed marriages and the fact of being Armenian into oblivion have completely removed any visible or commentable characteristics of the “Armenians”, including the “Alevi Armenians”. Being an “Armenian” in the present-day Dersim is a recollection about the Armenian origin only. It is noteworthy that the Armenians who were Alevized before the ones that became Alevized in the 20th century do not refer to their genealogical past, and do not have any emotional conflict with “Zaza-Kyzylbash-Alevi” identity. Some cultural habits may witness their possible Armenian past, such as: “The Kyzylbashs in Dersim have a custom to take a child when ill to the Armenian churches, give a baby to drink water from the soil of the church, and make a sacrifice...” Such phenomena are all over Dersim, but only in the Alevi environment. Tankut, Hasan R., 'Zazalar hakkinda sosyolojik tetkiler', M. Bayrak, Açik-Gizli/ Resmi-Gayriresmi Kürdoloji Belgeleri, Ankara: Özge, 1994 (1935), page 470-3. Cf. White 1908, էջ 230, White, George E., "Some non-conforming Turks", Moslem World, 1918, page 246. Riza Nur, Hayat ve Hatiratim. Riza Nur-Atatürk Kavgasi, Istanbul, 1992, հ. 3, էջ. 112. Zaza-speaking Alevis in Dersim kept on insisting on it even in 2011. Saying Dersimian in this case my companion meant Zaza language. Thus, “Dersimian”, as a confirmation of the possibility of Zaza-Alevian with regard to Dersim, has been “registered” in the list of the identity-related terms (added by H. Kh. ).